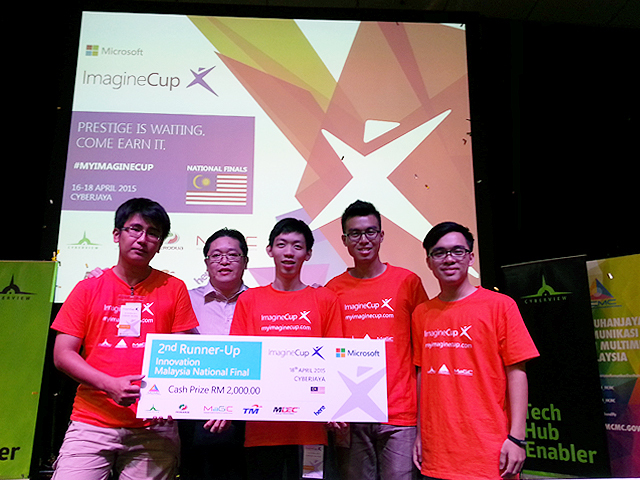 A team of UTAR students won the third place in the Innovation Category in the Microsoft Imagine Cup Malaysia finals which was held at Multimedia University, Cyberjaya, from 16 to 18 April 2015. Nicknamed iCu, the four-member team comprised Joseph Foo Chean Hsu, Ngoo Chun Sin, Ng Yuxin and Tan Khai Ching. They are third-year Bachelor of Information Technology (Hons) Communications and Networking students from the Faculty of Information and Communication Technology (FICT). They received a mock cheque of RM2,000 and certificates of participation. Their project, titled ‘Smartphone Discovering Application’, aimed to provide an overlay network that does not require any server and sends and receives distress signal using the Mobile Ad-Hoc Network (MANET) technology. The application is used for search and rescue team in areas where there is no connectivity at all. The team also expressed their appreciation to their mentor and FICT lecturer, Tan Teik Boon. “It was Mr Tan who proposed to us the project idea. We are very thankful to him for his invaluable advice and guidance, and for helping us to clinch the third place in the national finals,” said Joseph. The team started to work on the project one month before the competition. After much research on MANET and Microsoft technology, they submitted their proposal as entry for the Imagine Cup. The team started to develop their project after being notified that iCu has been shortlisted for the semifinals. In developing the project, they managed to overcome challenges such as integrating MANET into Windows phone and how to deliver their ideas convincingly to the judges. “We could not be happier with our performance in the national finals. To be able to rank third after such a short period of development time is something we should be proud of,” added Joseph. He, however, agreed that the team would have performed better if they started to develop the project earlier. Founded in 2013, the Microsoft Imagine Cup is a global student technology competition that provides opportunities for students across all disciplines to team up and use their creativity, passion and knowledge of technology to create applications, games and integrated solutions that change the way people live, work and play. The Innovation Category recognises the most innovative, ground-breaking and appealing software built using Microsoft tools and technology.